A giant inflatable snowman, its head bowed under the ceiling, inhabits the centre of Union Pacific gallery. His carrot nose and coal black eyes greet you leeringly and his unsettling scale recalls the snowman’s origin as a dark folk character. Jan Kiefer’s Skiing Snowman pushes the other works to the edges of Union Pacific’s storefront space off Petticoat Lane. 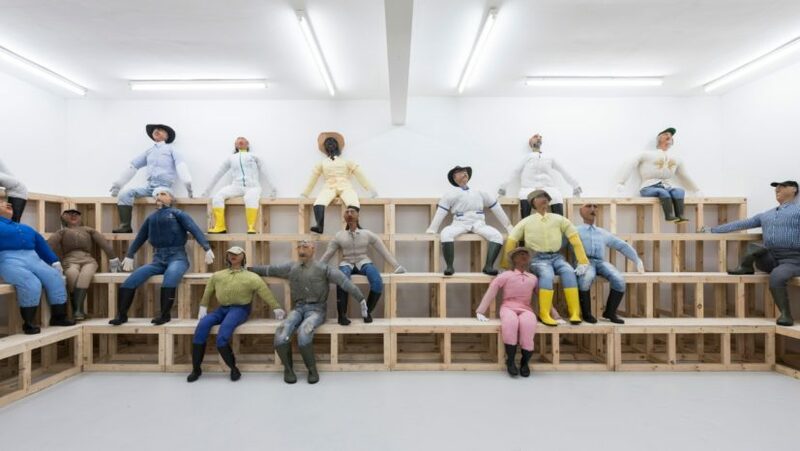 These include Ken Kagami’s Comedy Klein (Chucky) doll with the body prints he has made, and Motoyuki Daifu’s photographs of cluttered Japanese interiors overloaded with trash that would give Marie Kondo a nervous breakdown. It’s a more-is-more approach, exuberant, welcoming and unsettling, punctuated by Dirty Ghost (prototype 2), a pair of mechanical ballet slippers by Yoan Mudry, kicking into action from time to time. This lively collaboration between Union Pacific, Tokyo’s Misako & Rosen, and Cologne’s Jan Kaps, is the perfect introduction to the CONDO concept. Now in its second edition, CONDO offers a highly enjoyable way to encounter new artists in a relaxed, festival-like context. It contrasts with the often exhausting conditions of art fairs such as Frieze, where one’s stamina can fail. Instead, when walking between galleries along London’s wintry streets, the works just seen have time and space to seep into your consciousness. The preview weekend of CONDO was buzzing, with old friends catching up and new meetings laying the foundations for future collaborations. Both host and guest gallerists were on hand to elucidate the exhibited works and it is heartening to witness such a collaborative, rather than competitive, artworld event. The origins of the various gallery partnerships varied, as did their interpretations of the opportunity. Formats were either a collaborative group show, two solo presentations in dialogue, a group show with one guest artist, or two distinctly separate rooms. Since little information was available in advance, each show was a wonderful surprise. With London Olympia’s ARTfair on pause this year for a re-think, it seems new models are being sought. CONDO is beneficial to curators, collectors and gallerists; saving everyone’s carbon footprint and travel costs. Berlin’s Gallery Weekend and Sunday Art Fair are perhaps its nearest relatives. CONDO feels like a mini-biennial with visitors moving between venues clutching its distinctive red and blue map. Unsurprisingly however, unlike most biennials, the works on display are relatively small scale, easily transportable and collectible, but high impact. Videos or large-scale installations are few and far between. This cooperative attitude amongst art galleries offers a ray of hope in what feels like a rather divisive times. CONDO’s timing is perfect too, offering an antidote to what is becoming an increasingly ‘dry’ January after the glut of programming focused around Frieze in October. CONDO is the brainchild of Vanessa Carlos, director of Carlos/Ishikawa, who knows first-hand the costs of participating in art fairs for smaller galleries. CONDO allows galleries from Berlin to Guatemala City to avoid this prohibitive expense but still reach a London audience. The model, arising from a sharing economy, is based on generosity and mutual support. Guest galleries pay a minimal fee towards expenses and host galleries give their space in kind. A sign of CONDO 2016’s success is that the number of host galleries this year has doubled from 8 to 15, with larger galleries such as Maureen Paley and Sadie Coles HQ now on board. The number of guests has also risen by a third, from 24 to 36. I have visited nearly every CONDO show now and would recommend everything I have seen. For me, CONDO has been a parade of the zeitgeist filtered through the minds of today’s contemporary artists. Works that stayed with me and engaged my imagination were predominantly sculptural and playful. Carlos/Ishikawa presented unexpected work by Oscar Murillo, stuffed effigies of villagers from his native Columbia entitled Human Resources. Wearing vibrantly patterned shirts and jeans, or factory overalls, they sat around the gallery on bleachers, waiting for the entertainment to start. Under the eaves at Southard Reid, meanwhile, a troupe of porcelain-faced dogs, mouths agape, are having a sleepover in bright green and blue sleeping bags. This beguiling Phantom Camp was the work of Estonian artist Kris Lemsalu, presented by Glasgow gallery Koppe Astner. Over at The Sunday Painter in Peckham, Emma Hart’s ceramic clipboards evoke dispiriting feedback surveys and banal market research questionnaires. Covered in doodles, puns and slogans they frame the view onto the church outside. They pair provocatively with the UV tube light bulbs that Brazilian artist Adriano Amaral has subjected to alchemical processes, transforming their surfaces. Anna Zacharoff’s Bye love, I see you later this evening series populated Vilma Gold with oversize chessmen built of cracked clay pots, repaired with gold leaf according to kintsugi philosophy. Rodeo Gallery’s guest Supportico Lopez from Berlin exhibited a disquieting installation by Franziska Lantz entitled Expanding Arid Zones. Lantz suspended objects retrieved from the banks of the Thames at low tide like puppets or ritual objects. The fruits of her mudlarking are animal bones, rags, wood and scrap metal, crowded with memories. As they move in the breeze they could be ornaments in a witch doctor’s dwelling, relics for a post-apocalyptic religion or props from a horror film. They contrast sharply with the lurid window of TK Maxx visible out the window. 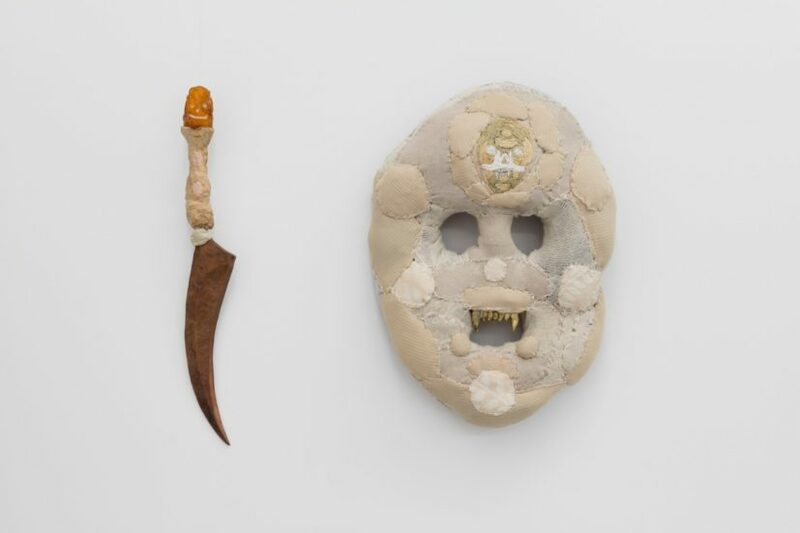 Emalin in Shoreditch presented a richly suggestive show, both aesthetically and conceptually, on the subject of ‘faciality’. It took the face as a point of departure, the seat of identification and individuality but also a mask or performative disguise. The works then probed and dismantled these assumptions, through disfiguration, fragmentation and absence. There are no portraits here; the face is an abstract entity, an organ, something we yearn to recognise in inanimate objects. 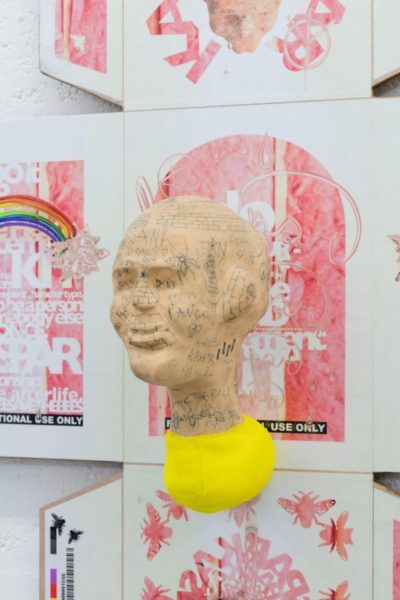 I was fascinated by Nicholas Cheveldave’s uncanny pink head, tattooed with doodles, neck stump wrapped in yellow gaze called KASPAR PT.1 – Do it Yourself at Home, Head Replacement Kit. It comes in a flat pack box and is named after the ‘wild boy’ Kaspar Hauser, who grew up in captivity and did not learn speech, and loosely modeled on KASPAR: a minimally-expressive humanoid robot designed as a therapeutic toy for autistic children. Riffs on African masks and their use in modernist art history are omnipresent at Emalin. Evgeny Antufiev’s Untitled is a padded mask made from patchwork beige materials. It has a friendly smile but fearsome teeth and is paired with a rusty knife, whose hint of primeval violence is undercut by the smiley face carved into its amber hilt. Beside it, inhabiting the borderline between abstraction and faciality, a cast bronze fountain in matt black by Michael Sailstorfer sheds a tear from an eye-like aperture. I left the exhibition reflecting on how, while social media allows us to ‘face-tune’ and ‘filter’ our way to a standardised beauty, in reality facial recognition technology is being used to survey and control us. Our face, rather than being our fortune, will become our prison.